Andrew Johnson was given the choice to cut his dreadlocks or forfeit his wrestling match for Buena Regional High. He cut his hair then won. Johnson is black, the referee who gave the ultimatum is white. The incident has once again sparked a social media backlash and questions about the treatment of young people of color. 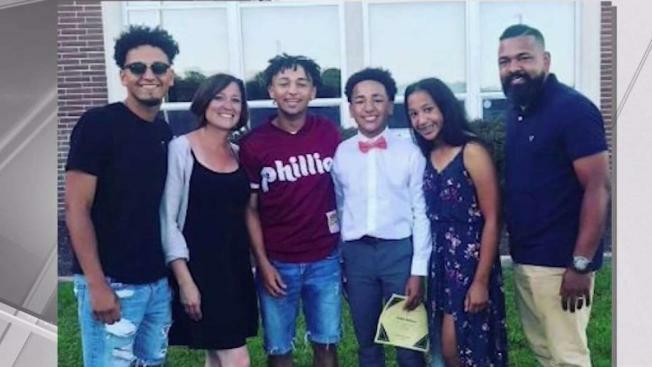 The parents of a black New Jersey high school wrestler, who was forced by a white referee to cut off his dreadlocks, and the family's attorney are placing blame on the referee and awaiting the results of a state civil rights inquiry before taking any additional action against those who hired the ref. Buena Regional High School wrestler Andrew Johnson's family and lawyer blame ref Alan Maloney's tardiness and a previous bias incident. “As this matter is further investigated, the family wants to be clear that they are supportive of Andrew’s coaches and the team’s athletic trainer,” Dominic A. Speziali, of Philadelphia-based J. Fine Law Group, said on behalf of Rosa and Charles Johnson Monday. "The blame here rests primarily with the referee and those that permitted him to continue in that role despite clear evidence of what should be a disqualifying race-related transgression." The family says Buena's coaching staff argued on behalf of Andrew Johnson. "Andrew was visibly shaken after he and his coaches made every effort to satisfy the referee short of having his hair cut," the family statement said. "But, as captured on video, the unyielding referee gave Andrew 90 seconds to either forfeit his match or cut his hair. Under duress but without any influence from the coaching staff or the athletic trainer, Andrew decided to have his hair cut rather than forfeit the match." A video originally tweeted by a SNJ Today reporter shows the Buena Regional High School junior standing dejected in the school's gym after being forced to choose between getting his hair cut or forfeiting last Wednesday. In the video, fans and coaches watch an official cut off Johnson's dreadlocks with a pair of scissors before he is allowed to compete. Speziali says Andrew Johnson was told his hair "wasn't in its natural state" and that Maloney called the teen's dreadlocks, "braids." The crowd cheers as Johnson wins the match — which helped his school to a tournament victory. Despite having his hand raised after the victory the junior stands with his shoulders slumped and head down as he walks off the mat to be comforted by his team. The American Civil Liberties Union's New Jersey chapter responded by tweeting that, "This is not about hair. This is about race. How many different ways will people try to exclude Black people from public life without having to declare their bigotry?" On Friday, the New Jersey State Interscholastic Athletic Association said it was conducting an investigation and had contacted Buena Regional High School officials and the referee involved in the incident. Michael Cherenson, spokesman for the association, said the organization had reached out to groups that assign referees "and they've all agreed" not to assign Maloney to any event until further notice. The association also said it was forwarding preliminary information to the New Jersey Division of Civil Rights and that, "given the degree of attention being focused on this matter," it would recommend that the referee not be assigned to any event until the incident "has been reviewed more thoroughly." Speziali and the Johnsons said Maloney didn't attend the weigh-in that day. They also say that when Maloney evaluated the teen before the match, he didn't raise any issues with the length of his hair or the need to wear a head covering. Maloney didn't respond to a request for comment Monday. The Johnsons credited wrestling for helping Johnson through this situation.